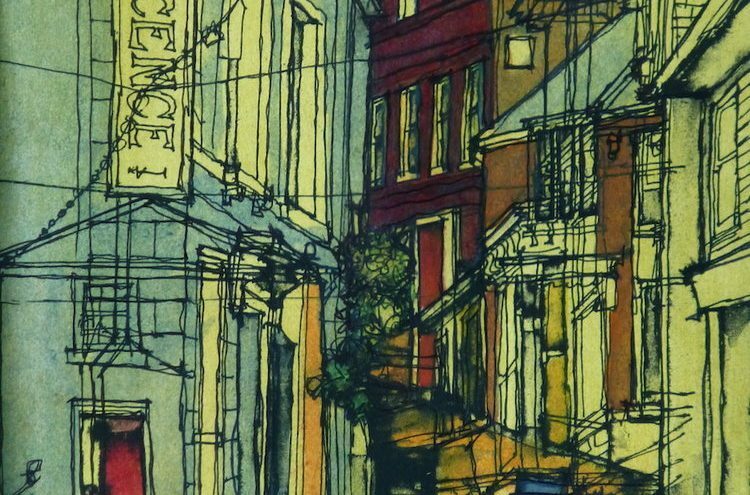 The Whitaker is showing a collection of townscape drawings and montages by Colin Binns taken from his exploration of urban spaces in our towns and cities, with a particular focus on the North West region. The collection shows his gradual development of single view point colour sketches towards the more complex multiple viewpoint montages that convey the energy and atmosphere of busy urban areas. All have been made through a mixed media process that involved drawing and painting directly on to screen prints of his original location sketches. Colin works from his studio on the Lancashire coast making mixed media paintings and drawings, where he constantly experiments with linework, texture, colour and collage, to make art that explores a sense of myth, memory and place. The work is generated from his direct experiences of places and events through memory notes, photographs and sketch studies on location, creating the essential material for the painting and drawing process in the studio. Recent mixed media drawings recreate the atmosphere and vibrancy of our town and city centres by reassembling his sketches as multiple viewpoints to mirror the way we take in more than one view at a time in our experience of urban spaces. This interest in townscapes was developed in depth during his MA studies at the University of Central Lancashire, where he experimented with his mixed media approach in the university’s Artlab studios over several years. Prior to his art practice, Colin enjoyed a career as an award winning architect and partner in the international design company BDP, leaving the practice in 1993 to lecture in art and design at Manchester and Preston. He left full time lecturing in 2001 to focus fully on his art practice and has since exhibited extensively throughout the UK in commercial and public galleries.